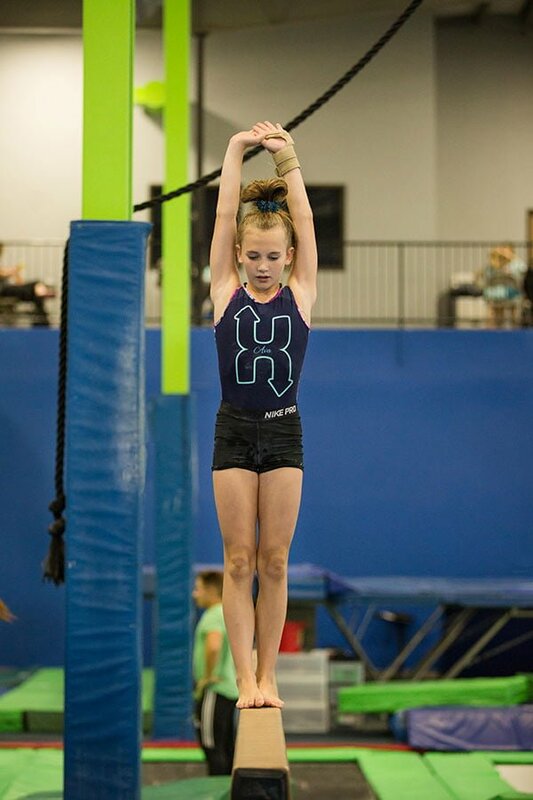 The Xcel Program provides training and competition experience for gymnasts outside of the traditional Junior Olympic program. Its stated purpose is "to provide gymnasts of varying abilities and commitment levels, the opportunity for a rewarding gymnastics experience." Participants compete in individual and team competitions in Bronze, Silver, Gold, Platinum, and Diamond divisions, based on age and ability level. If you’re interested in trying out for our XCEL teams, call (816) 347-8008. There are 5 levels to the USAG Xcel Program. The Xcel Program is designed to offer a broad-based, affordable competitive experience outside the traditional Jr. Olympic Program. All routines in this program are optional routines. The Bronze, Silver, and Gold levels will choreograph their routines for Bar, Beam, Floor, and Vault based on USAG or KC League rules, but the Platinum and Diamond levels will create their own routines. Each level has a competition and practice leotard, warmups, and a bag for the athletes. Bronze: The minimum age requirement for the Bronze division is 5 years old. (This means the gymnast must be 5 before she competes in her first meet.) The Bronze division is similar in skill requirements to the JO Program’s levels 1-2. Bronze gymnasts practice 4 hours a week. Gold: The minimum age requirement for the Gold division is 7 years old. (This means the gymnast must be 7 before she competes in her first meet.) Our Gold gymnasts are divided into Gold 1 (KC League) and Gold 2 (USAG).The gold division is similar in skill requirements to the JO Program’s levels 4-6. Gold gymnasts practice 6-9 hours per week and are eligible for State and Regional meets. Platinum: The minimum age requirement for the Platinum division is 8 years old. (This means the gymnast must be 8 before she competes in her first meet.) The platinum division is similar in skill requirements to the JO program’s level 5-7. Platinum athletes practice 9 hours a week during the school year and have the choice to practice 9-12 hours in the summer months. Diamond: The minimum age requirement for the Diamond division is 9 years old. (This means the gymnast must be 9 before she competes in her first meet.) The diamond division is similar in skill requirements to the JO program’s levels 8-10. Diamond athletes practice 9-12 hours a week and compete through USAG for the chance to qualify for State and Regional championships. The flexibility of the XCEL Teams means that we can encourage students to grow and improve their skills while overcoming any mental blocks or fears. Our primary focus is, and always will be, developing strong character through athletics. Call (816) 347-8008 today to schedule an evaluation with our elite coaches today!